At least nine climbers are feared dead and six more are missing in Nepal after an avalanche swept away Europeans and others on Himalayan peak Manaslu. Officials confirmed two bodies had been recovered while a further seven were spotted on the slopes of Mount Manaslu in the north of the country. The avalanche struck a base camp near the summit on Saturday, police said. 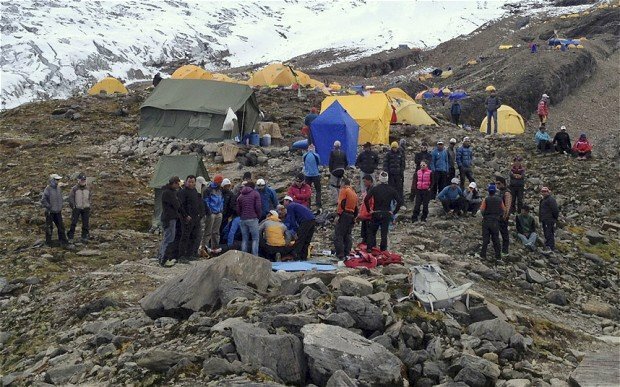 The two bodies recovered are said to be of a German and a Nepalese guide. Police official Basanta Bahadur Kuwar was quoted as saying by the Associated Press that 10 people had survived the avalanche but many among them were injured. They were being flown to hospitals by rescue helicopters, he added. Officials are trying to determine exactly how many people were in the climbing party. Deteriorating weather conditions meant it was impossible to continue air searches of the mountain on Sunday, Basanta Bahadur Kuwar said. The climbers were caught at 7,000 m (22,960 ft) as they were preparing to head toward the summit, which is 8,156 m high. “The avalanche hit camp three of the Manaslu peak… resulting in a flood of snow,” said Laxmi Dhakal, head of the Nepalese home ministry’s disaster response division. Hundreds of foreign climbers head every year for the Himalayas in Nepal, which has eight of the world’s 14 highest mountains, including Mount Everest. Manaslu, the eighth highest mountain in the world, is considered one of the most dangerous, with dozens of deaths in recent years. The autumn climbing season began this month.